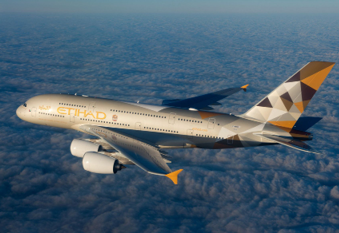 The only aircraft with a full upper deck, the A380 is the world’s largest commercial aircraft by passenger capacity. Airbus first toyed with the concept of an ultra-high-capacity aircraft as early as 1988, but it was only in 2000 that the A380 programme was formally launched. Following its first flight in April 2005, the A380 entered commercial service with Singapore Airlines in October 2007. The A380 is capable of transporting more than 850 passengers in a single class setup, and up to 560 passengers in a more traditional 3-cabin configuration. The immense floor space on-board the A380 has allowed airlines to introduce innovative premium features including double beds (Singapore Airlines Suites Class), showers (Emirates and Etihad), and on-board bars. 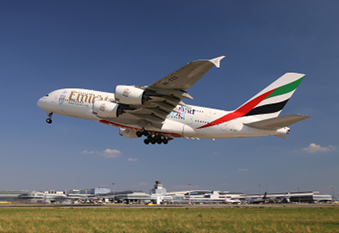 With 75 in service and 65 on order, Emirates is by far the largest operator of the A380. Other airlines with A380 fleets include Singapore Airlines, QANTAS and Asiana.